How can you maximise profitability from your inventory? The impact of ‘dead stock’ on a company’s return on investment can be devastating, and it is certainly worthwhile for companies to focus on reducing dead stock. Here are some of the dead stock issues faced by distributors, and how to minimise or eliminate them. If you’re forced to order more of a non-stock product than your customer is willing to buy or pay for, you end up with leftover inventory that will significantly reduce your profitability on the non-stock sale or even cause you to lose money. Accurate forecasting and measurement of customer requirements is therefore essential. ERP systems with integrated stock control and CRM simplify these calculations by keeping tabs on customer demands and matching them with inventory ordering. Recent research by Aberdeen Group shows that market leaders are looking to streamline processes, as well as optimise their supply chains. This means they can more effectively manage inventory, as well as keep prices for products in check. They have prioritised collaboration and service by getting a better understanding of customers’ needs. The graph below shows market leaders’ success rates through integration. Griffiths Equipment’s use their ERP system to enable the efficient and accurate fulfilment of customer orders, and the sharpening of inventory management processes to save time and money. Costly order errors have been reduced by 80%. “Our business is a leader in its field because we’re nimble on our feet,” says Managing Director, Peter Griffiths. Many distributors stock a product specifically for a single customer. Often distributors don’t realize that a customer has stopped buying one of these items until physical inventory time, when it’s discovered that there’s a lot of that product still unsold. It’s critical for distributors to review the stock status of all customer-specific inventory at least once a month to avoid the possibility of this material silently dying on the shelf. Introducing new products is exciting, but often the remaining inventory of items made obsolete by the new product is overlooked. When this old inventory is finally discovered, the only way to liquidate this stock is to sell it for scrap value. As part of your policy for introducing new products, be sure to insist on a plan for liquidating the remaining inventory of any obsolete stock. You must also be sure that you’re carefully monitoring market trends – another job for ERP. Yogurt products exporter EasiYO uses its ERP system to garner valuable insights and predict sales trends from geographical and demographic data. “With dairy prices spiralling worldwide, the need to constantly review margins, pricing and sales trends has become enormously important,” says David Granger, General Manager. Many companies only focus on maximizing their gross margins. But is this a true measure of corporate profitability? Many distributors are surprised to learn that inventory turnover is just as important. An integrated inventory management solution can help you make informed decisions, streamline processes and optimise your inventory management. This not only helps you stay competitive and efficient, but ensures that you free up working capital, where possible. With improved visibility into supply and demand, businesses can make critical decisions about where to reduce inventory, while still maintaining the highest levels of customer service. Integrated inventory planning tools provide the forward-looking data and intelligence that allow businesses to be proactive about the future – instead of being reactive based on the past. Contact Horizon today for more information or to arrange a demonstration of MYOB EXO or MYOB Advanced ERP. Article reproduced via MYOB Australia. 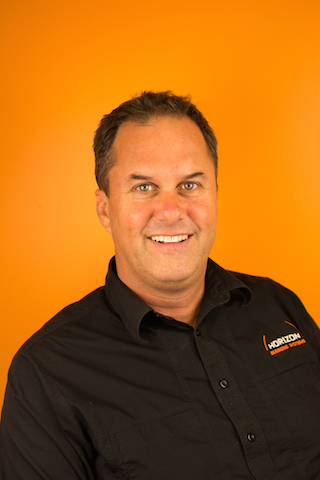 This month on the blog we sat down for a Q&A with our CEO Michael Pendred to find out more about the history of Horizon Business Systems; get an insight into Michael’s vision for helping other businesses achieve, and how Horizon is doing so. What prompted your to set up Horizon Business Systems? I’m interested in how things work, how things are built, new ideas and hearing about the very cool things that our clients do. I think that I’d be bored if all I dealt with was my own business, so having Horizon allows me to step into lots of different businesses and see how they work. I find the complexities in how companies manage their jobbing or other business/management processes intriguing and I’m always looking for better ways of doing things – I know that I should get out more! I also wanted a business where we really felt like a team. I’m lucky enough that the crew that Jon and I have brought together at Horizon are people that we really like and we enjoy working with them. All the personalities are different, all of their skills and the experiences that they bring to us are amazing, and they all believe in our vision of ‘helping businesses achieve’. I’ve always felt that it’s an insular view to just want your own business to be successful – if you aren’t contributing to the business community, the local economy and to the success of other businesses, you can’t stay successful for long. I have a degree in Financial Management and Economics but have had the opportunity to work across different industries with sales and management roles in the Financial, Hospitality, Tourism, Health and IT industries across the world over the past 25 years. What is the most common issue or pain point that customers have when they come to Horizon? A lot of the time our clients have experienced growth and added on to the systems that they were using when they first started up – e.g. piggy-backing disparate systems, double handling of tasks etc. – so they are really looking to simplify things for themselves. It seems really straightforward, but having a system like MYOB EXO makes life easier for everyone from the Receptionist to the CEO. This can include no longer having things (like customers or orders!) ‘slip through the cracks’, tasks can be completed more accurately and efficiently, and provide employees and management an overall view to manage all the critical processes in their business and ultimately make better decisions going forward. How do you help them better than competitors can? I believe that one of our team’s most important skills is that we don’t walk into a business with the idea that we already KNOW how they work. We want our clients to tell us what works for them and what they need – then we go out of our way to value add to this. Each client that we work with, even those that provide similar services or products, do certain things uniquely. Of course we want them to be compliant – just to limit that particular pain! – but we also understand that the companies that are our clients have built themselves from small businesses into successful companies, so they’ve done a lot of things right to get themselves to this point. These are businesses that just need our input to streamline things and help them get to the next level. Every client relationship that we build also adds to our own skill set as we learn something new from each business. A lot of consultancy businesses out there will go into companies with the view that they will just replicate what they did last week at another business, rather than take the time to understand and respect the way that you do business. We genuinely feel invested in each of our clients – most likely because we are a local business too. What has been the most interesting or unusual request you’ve had for custom add-on development? I try to think of myself as a person who has not led a sheltered life but I may have blushed (or asked for clarification!) once or twice when we were building customised reporting dashboards for Adult Shop! In the short term, it’s seeing the change in companies once we are able to help them make once painful processes in businesses pleasant. In the longer term, several of our clients were just taking the leap from a small to mid-sized business a decade ago when Horizon began and we have enjoyed seeing them grow and become even more successful. One of my pastimes is ‘client spotting’; where I’m driving somewhere with my family and I point at a business, sign or company badged car and go ‘there’s one of our clients!’ – it used to be a rare spot but, after a decade in Western Australia, it’s a lot more common now. What has been Horizon’s greatest achievement in your eyes? We have won MYOB’s Partner of the Year a few times but I truly think that last year’s MYOB Excellence in Customer Satisfaction (Australia) award was the most satisfying. It’s a real team effort and is the best measure of our client focus and success. What new trends or developments are emerging or do you predict will emerge in the next few years? The development teams behind MYOB EXO and MYOB Advanced are amazing. We are fortunate that MYOB is an established product provider than can and does prioritise continual development for its ERP business management software offerings. Because MYOB’s EXO and MYOB Advanced ERP products are geared towards mid-sized businesses, rather than monolithic business entities/large scale government bodies (where processes are carved in stone and changes don’t occur at speed or with any regularity), MYOB and its products are open to, and usually leading, ERP development. As Platinum Partners with MYOB, the team at Horizon are ‘at the coal face’ in our day to day dealings with the companies that use the products, so we make it a priority to have an open and continual dialogue with MYOB about our clients’ needs and projected requirements for the future. Cloud solutions have been emerging over the last few years and these will gain a larger market footprint as time goes on. Mobile add-ons in time capture, service management and reporting will become the norm. Also, the tools and customisation that once only the big businesses could afford, are filtering down to being more manageable, mobile and cost effective adaptations for mid-sized businesses.